Sweet William was cranky, drooly, and drippy for weeks. I thought he was fighting through a cold until I saw a molar pop up. The poor kid went on to cut five more teeth in the course of a month. 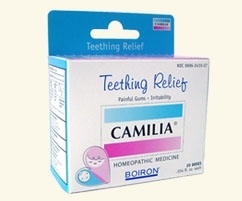 Our pharmacist at Kids Rx (a wonderful resource for New Yorkers) recommended Boiron Camilia for teething. It’s a homeopathic formula that relieves gum soreness, upset stomach, and irritability. It comes as a liquid in single-dose capsules that you squeeze into baby’s mouth (much easier than massaging a gel onto his gums). It doesn’t numb the gums and can be safely re-administered every 15 minutes, if necessary. It’s non-allergenic and without side effects. Camilia worked wonders for William. It helped him get back to sleep at night, improved his mood, and let us avoid giving him ibuprofen. See Boiron’s fact sheet for more information.